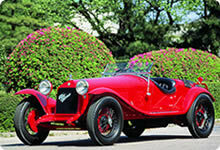 Models on display: 6c 1750 Gran Sport (1930) Tazio Nuvolari won the 1930 Mille Miglia with this car. Opening hours: Tuesday to Sunday from 9:30 AM to 5 PM. Closed Monday. When a National Holiday falls on a Monday, the museum will be closed on the following day, and during the New Year’s holiday. Last admission 30 minutes before closing.